Redmi note 4 which was released at the same time as srt is still stuck at nougat, 7. So at least we are on Oreo. Smartron should at least give one more update fixing whatever they have worked on till now, specially network issue in 4g. I actually got to say that I am going to go live on Facebook about this software issue and going to leave smartron company to a shame because they left us in a buggy os. Atleast give 8.1 update and then stop further updates. @Abhishek_TV @Team this act of not stabilizing the buggy oreo and also not providing us with security patches literally means that U've defrauded us. Apologies if it is too harsh but u've lured us with promises and u r not fulfilling them. The least u can do is stabilise the oreo update which comes with too much of bugs, network issues and most importantly battery drain. Kindly think about it. Indeed very dissappointed. If smartron stop supporting the srt without fixing the bugs , forum members going to stop support smartron . And smartron will loose the mouth to mouth publicity . If someone wants smartron srt for 6500 then can contact me it's true it's damn true. I have only one question @Abhishek_TV. When you know that the phone will get hot while doing simple task,( not gaming). You use two layers of plastic, one is where NFC is written and one the back cover. Your design is very bad. That is why the phone heats up like crazy. You could have used metal thus Smartron used plastic to grain profit from srt.phone. 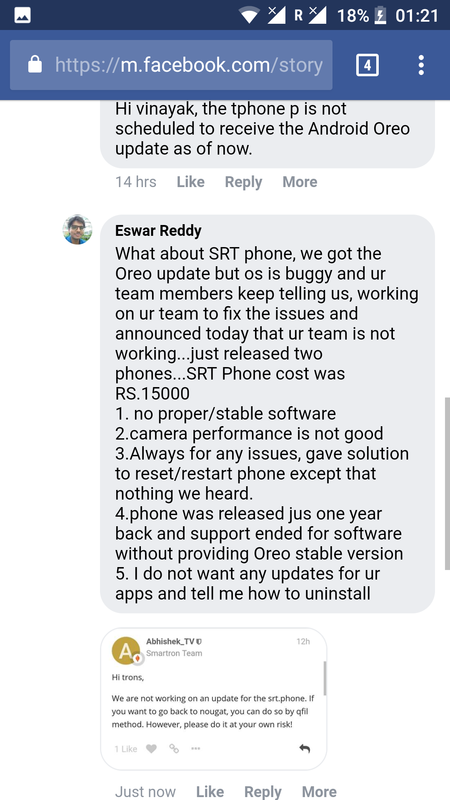 GIVE REPLY TO ALL THE USERS OF SRT.PHONE. Do not give updates but at least fix the bugs, you have given with the Oreo update. That is liability on Smartron. It is just impossible to use Srt.phone with fluctuating network (phone is unusable while traveling). Does Smartron think to smoothly sail through with new launches after deceiving its existing customer? we won't simply allow it to happen. @Abhishek_TV, so support for SRT phone is over ? @Abhishek_TV, gone...smartron will be shutdown. 3. Camera performance -- child can determine utimately was failed.